The first China-CzechBilateral Forum on Organic Chemistry was held in Shanghai Institute of Organic Chemistry (SIOC), Chinese Academy of Sciences (CAS) on Sep. 24, 2010. About 100 scientists, researchers and students from SIOC and the Institute of Organic Chemistry and Biochemistry (IOCB), Academy of Sciences of the Czech Republic (ASCR) participated this forum.As the biggest chemical research organization in Czech, Institute of Organic Chemistry and BiochemistryASCR has a long history and outstanding academic achievements. In recent years, IOCB achieved remarkable achievements, especially in the fields of antimicrobial drug R&D and anti-HIV drug research. Prof. Kuiling DING, the director of SIOC, extended a warm welcome to the Czech delegation which headed by the director of IOCB, Prof. Zdeněk Havlas. DING highly appreciated IOBC for her impressive academic achievements on organic chemistry and biochemistry. He also gave an overview of SIOC to the Czech guests. Early in 1960, just after the establishment of the IOCB, Prof. Minglong HUANG of SIOC already had paid an academic visit to IOCB. So, 50 years later, this bilateral forum held in Shanghai during EXPO 2010 is particularly important. DING hoped that the forum would provide a good opportunity to exchange academic views and foster new collaboration between two institutions. 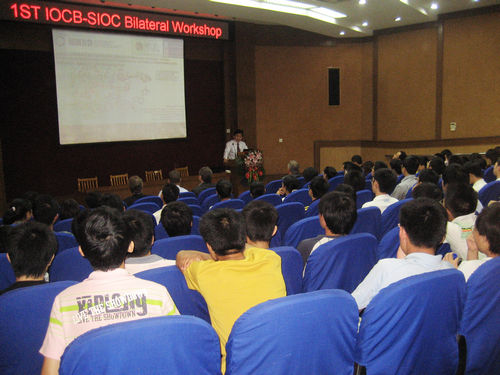 Deputy director of SIOC, Prof. Dawei MA chaired the Forum. Six Scientists from IOCB and SIOC gave academic lectures covering medicinal chemistry, natural product chemistry and computational chemistry. The scientists from both sides also expressed that this forum was very successful. This event will definitely facilitate the academic exchanges between two countries and strengthen the friendship between the scientists of both institutions.